I think I am going to get back on the "empty" bandwagon as it is a great way to micro-review some products that may not make it to the blog for whatever reason. However I do struggle keeping empty bottles in order to post about them so this could well be an empty promise...gosh I'm so witty. This is my night cream although it is intended for every day use but my oily skin handles it better as a night cream. It is light and cooling and when teamed with a facial oil (Clarins again) it allows me to awaken to fresh, hydrated and glowing skin. 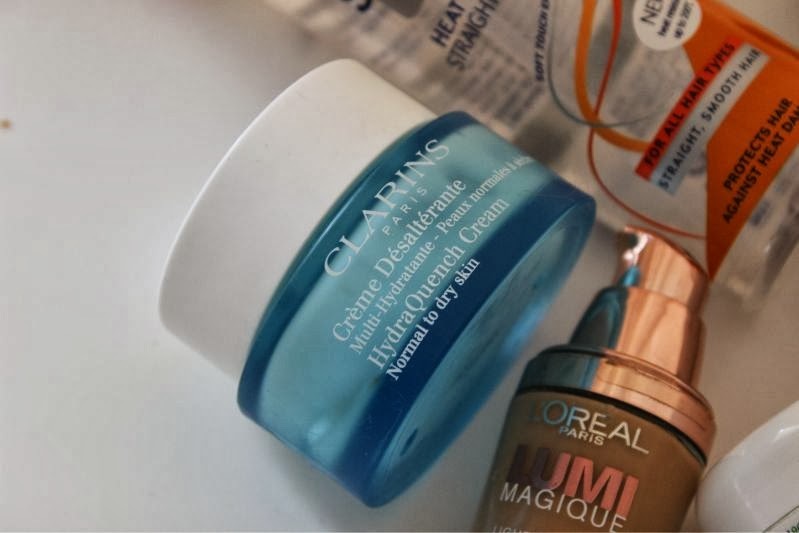 I will be hitting the Clarins counter soon to pick up a few more pieces from this range as it is easily one of the best I have stumbled across and I recommend it to all especially now as the weather in the UK is quickly becoming harsh. Mario Badescu the skin care brand of choice for Jennifer Anniston, Kate Moss and erm P.Diddy? 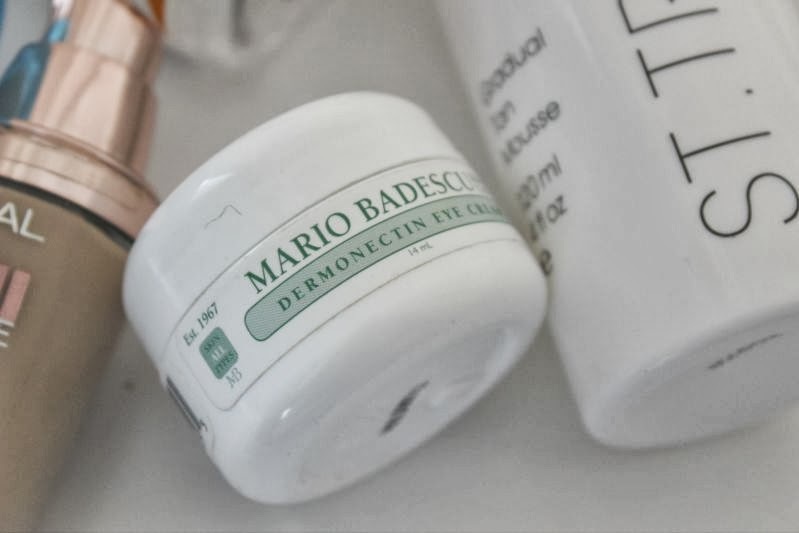 I have been tinkering with pieces of Mario Badescu's skin care range over the last few months and will have reviews in the coming weeks but for me the stand out product has to be Mario Badescu's Dermonectin Eye Cream which is intended for severely dry skin. Although generally speaking I have oily skin my under eye area tends to dry out rather quickly and this is the only eye cream that has a light weight texture yet moisturises such area intensively. A quick application before bed keeps dry, crêpey skin at bay and at £17.95 a jar who is complaining? I will review this product in full once my new jar arrives so I can show the texture etc. This isn't quite empty but it will be by the next time I use it and as I said I don't like holding on to old bottles. 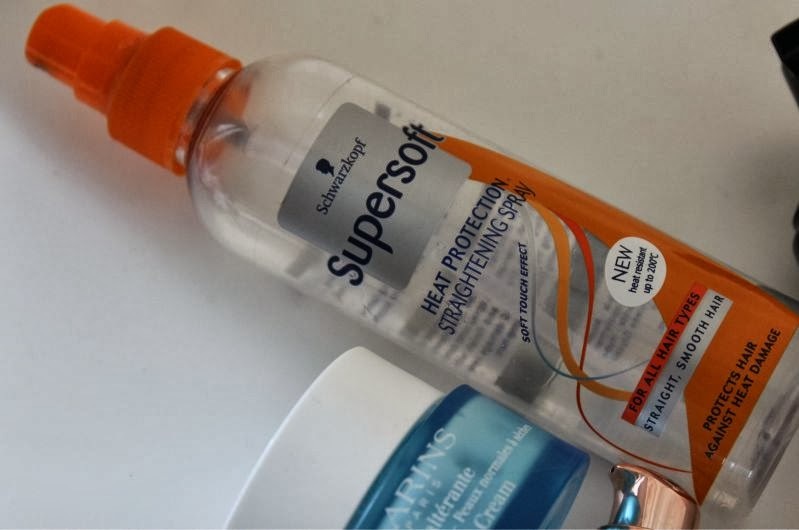 If like myself you straighten your hair fairly regularly this is the heat protection spray you need - it protects the hair up to 200 degrees without any stickiness, just smooth, silky hair without the damage. I have tried many a spray of this type and this is the one I always go back to and at £2.99 (approx) as long as they keep making it, I'll keep buying! Don't buy this online rather go to your local Savers or Body Care store as it is so much cheaper in there. 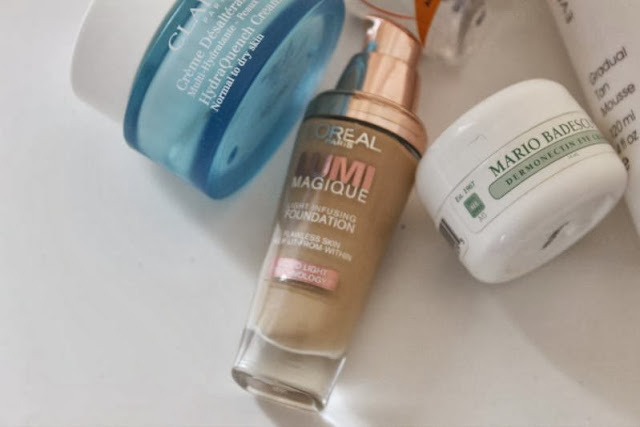 I constantly harp on about this foundation and for good reason it similar to NARS Sheer Glow Foundation only marginally cheaper and with less shade choice. However if you are looking for a great glowy everyday foundation that won't break the bank this is the one to go for - it has medium coverage, gives a lit within glow and even works well on oily skin. What is not to love! This is my current Autumnal tanner in that it helps even out my skin tone, gives a natural hint of colour that isn't as deep as my summer tanners. It is a little drying but other than that I have no complaints and would recommend it to anyone looking for a subtle self tanner. What have you used up and recommend trying out recently? I did a post about the Clarins HydraQuench Cream gift set! 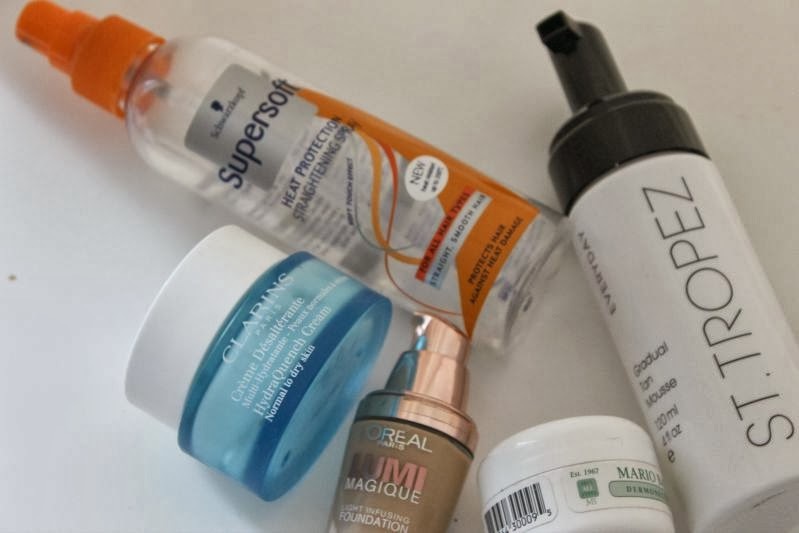 A total bargain for you if you are going to repurchase! I adore HydraQuench cream and I use it as a night cream too because its just too rich. Plus it takes forever for it to be absorbed so I have to wait forever to apply make up. I adore the hydra quench serum, if you haven't tried that I'd definitely recommend it from their range. I'll be sure to try out their day cream next time I'm near a counter it sounds perfect for my skin. 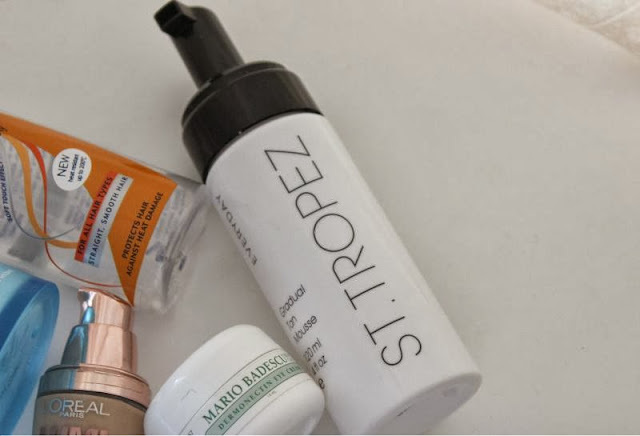 I love favourite posts; brings my attention to so many products I didn't even know existed before!